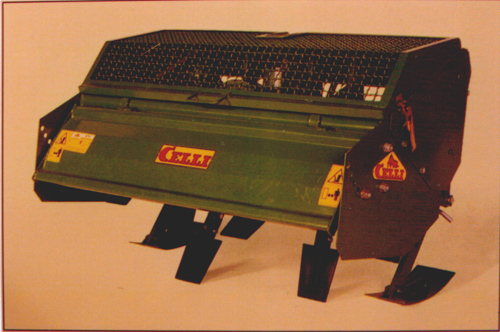 The Celli Spading Machine is an articulating spader. The spades work like a hand shovel on a crank shaft. Each spade shovel takes a turn entering the soil, so very little horsepower is needed to operate it. This makes it the ideal primary tillage tool for low horsepower tractors. It can also till damp ground to open it up and dry it out for early spring plantings. These are the two main advantages over the chisel plow. Like the Chisel Plow, it can be adjusted to till deep or shallow and can till one bed at a time. The Spading Machine is the ideal tillage tool because the spading action completely loosens the soil across the bed and its motion does not compact or smear the soil at the bottom of its travel. However, spading machines do not "double dig" and will invert soil with repeated use . 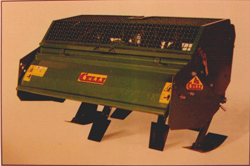 Articulating spading machines used in clay soil do not finish the bed or incorporate trash very well, so a rototiller or other finishing tool is needed to complete the job. When used in sandy soil, they can produce a finished seed bed and incorporate green matter. It is important to know that there are two types of "Spading Machines". A true spading machine articulates and works like a hand spade shovel. The spade goes straight down into the ground and tips back on the up stroke, throwing the soil against the rear door to break it apart. 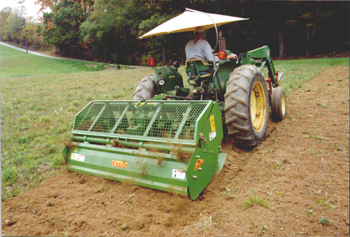 A Rotary "Spader" works like a rototiller with a spade sweep moving in a circular motion. They can produce a finished seed bed in clay soil and turn under all of the green matter in one pass with the optional rear power harrow, but may cause soil compaction and smearing of the soil at the bottom of their travel. We handle Gramegna and Celli Articulating Spaders, but the Celli is currently the best value and includes the 4 speed gearbox and a PTO slip clutch. Larger models are available. VHS Video Coming Soon!